RANGELY CHRISTMAS MEMORIES, #2: ST. TIMOTHY'S CHURCH ADVENT EVENTS. From the early 1960's to around 1970 or so, St. Timothy's Episcopal Church in Rangely was under the Rectorship of Fr. Leon Wilkens and his wife Mary Wilkins (also known widely as children's book author Mary Calhoun). My family attended there, and for us eastern transplants, Rangely Christmas there was a special time. 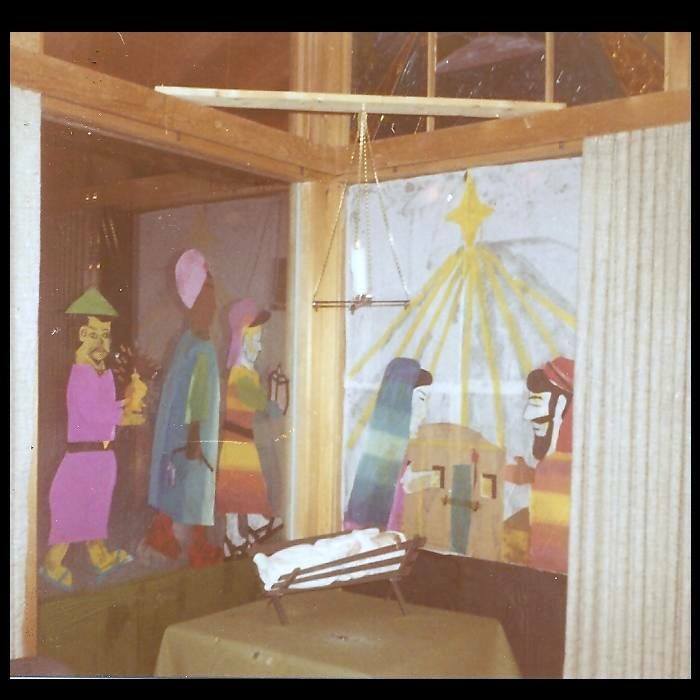 The youth group -- always struggling, with not quite enough kids to guarantee long-term survival but still hanging on -- would decorate the big plate glass NE windows in the sanctuary with tissue paper and paste figures of the Holy Family and the Christ Child. Just before Advent, church families would get tree permits and we would car-caravan out Dragon Road to prepare for the "Hanging of the Greens". The kids would sled and have snowball fights as the adults cut down trees and boughs to beautify the church for the Season. An afternoon of hanging the greenery, bedecking it with colored lights, and generally cleaning up and preparing the facility for Christmas Eve followed -- with Christmas music playing in the background from the Wilkin's cassette tape recorder, and the smell of Leon's famous Venison Chili -- super hot, and having been simmering in the church kitchen for several days -- filled the room. That night, a hearty Pot Luck supper would follow. Rangely hunters brought such exotic dishes as Rabbit, Snake (? ), and other delights -- along with the regulars such as potato salad and chips and dip. By the time we all went home, a very distinct sense of anticipation was in the air ... the Special Night was now not all that far away! Pool Party- Rangely Rec Center!